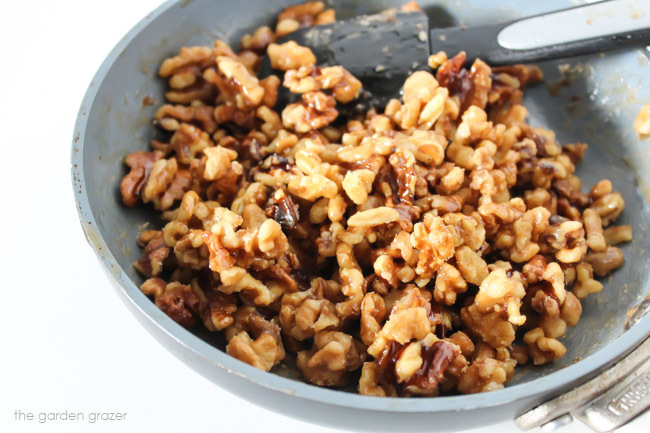 These super easy candied nuts are made healthier using a hint of vanilla and sweet & flavorful maple syrup instead of refined sugar! Only 5 minutes to make and delicious for snacking, salads, sweet potato toppers, gift-giving, etc.! We’re wild for these! They’re healthier (and I think tastier) than traditional candied nuts, replacing all that refined sugar with pure maple syrup goodness. Plus there’s a wonderful hint of vanilla that just sends it over the top. And they only take about 5 minutes to make! Though I feel I should toss in a warning here: I burned my tongue not once… not twice… but THREE times because they were so darn good and I was too impatient for them to cool. Once I managed to find some self-control, I put them in a sealed container for later (to sprinkle on an autumn salad with pears, apples, and mixed greens – yum!) They’re awesome as snacks, and great for gift-giving too! 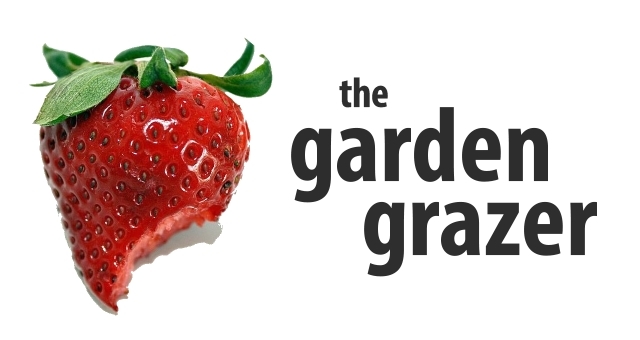 Come join The Garden Grazer on Instagram 🍓 and share a pic if you make these! I love seeing your recreations. Stir frequently until syrup is caramelized, about 3-4 minutes. Remove from heat, transfer to a plate and let cool. The nuts will be quite sticky right after heating. Simply let them cool for 15-20 minutes then gently break them apart if they’re clumped together. Store in a sealed container. Alternative baking option (via my sweet sister-in-law)! She used a combination of walnuts & pecans, coated them in the syrup + vanilla + salt mixture, then spread out on a sheet pan to bake at 400 degrees for about 10-15 minutes, watching closely so they didn’t burn. LOVE this idea! What a great way to start your December posts! oooh this is basically the filling for baklava! mmmm making my mouth water, looks like i could get fat off of this! These look delish! Going to have to make these for sure! These look like the perfect pre-Christmas dinner nibble. 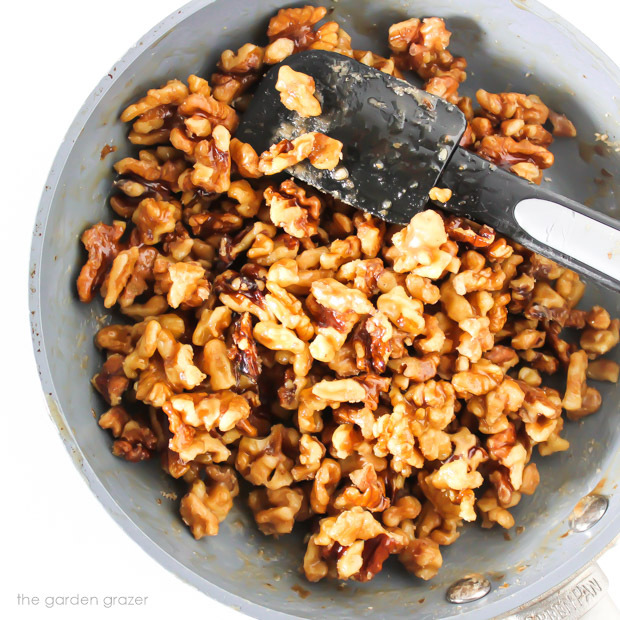 I think I'll have to go with pecans, as walnuts just taste funny to me, but I love the simplicity! Any idea how long these would keep if in an airtight contianer? I'm looking for snacks like this to send to ou troops overseas. Shipping time is anywhere from 7-14 days, but with the holidays here both postal services are aiming that all get there in time for Christmas. Just wondering if this is something i could send as iI think they would make an awesome gift from back home. Hi Kay! Wow, what a wonderful and thoughtful idea! These would definitely make an awesome gift. I really don't see what would go wrong with these in a week or two, BUT (and this is a big but) I'm certainly no expert in food safety so please use your own best judgement. These have never made it past a few days in our house, so unfortunately I can't weigh in from personal experience… 🙂 So sorry I couldn't be more help, I wish I knew that answer for you! Good luck and happy holidays to you!! I think I would be impatient for them to cool too. 😉 I was also thinking that these would be a great gift! 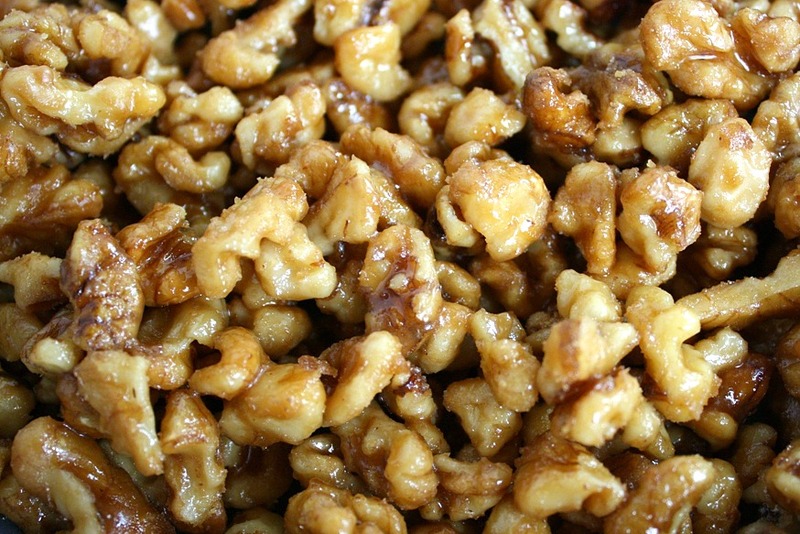 My aunt used to always make cinnamon candied nuts and give them out for Christmas and they were popular with everyone! Oh yes – such a perfect gift idea for the holidays 🙂 I thought about doing a cinnamon variation with these but haven't gotten around to it yet. I bet that would be fantastic as well! Wishing you a Merry Christmas Kiersten! Mmm mmm… These are sooo cute! 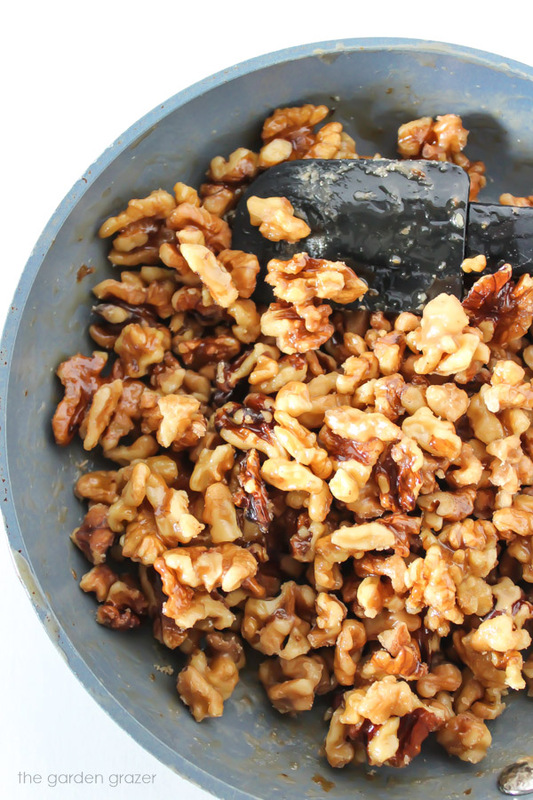 I used pecans and almonds, and added some unsweetened shredded coconut to the mix…. it turned out great! Thanks for a simple, easy, delicious recipe! I just made these to put on top of mashed butternut squash. It made the meal. I'm definitely gonna make 'em again. Probably for thanksgiving dinner in a couple weeks. These were so yummy! I coated half walnuts, half pecan halves with the mixture, then baked on a sheep pan at 400 degrees for 10-15 minutes. These are great for snacking and topping salads and sweet potatoes Kaitlin! And the boys LOVE them!